So, if you're curious, the title of the post is based on my mom's favorite song, Runaway. It's an oldie, but a goodie! I make up other songs to the tune of Runaway all the time. I have no clue why! I finished up my Wonderland quilt this week! It's made with two jelly rolls and a quarter square ruler. You can make your own template, but I work better (and keep my fingers) if I work with an acrylic ruler. It measures in the neighborhood of 60x70 so it's a perfect couch quilt. This one is going in my etsy store, but if it doesn't sell in a few months I'll probably just keep it! The binding is machine stitched with invisible thread--I cannot tell you how many hours it saves to machine stitch the binding! My birthday is Saturday and I'm going to be out of town for the weekend at a workshop (psst! Anne Kelle will be there!!!!) so the blog will be a bit quiet until I get back and fire up the old sewing machine again. I'm sure my machine will appreciate the break! Oh how gorgeous! I *adore* Wonderland. 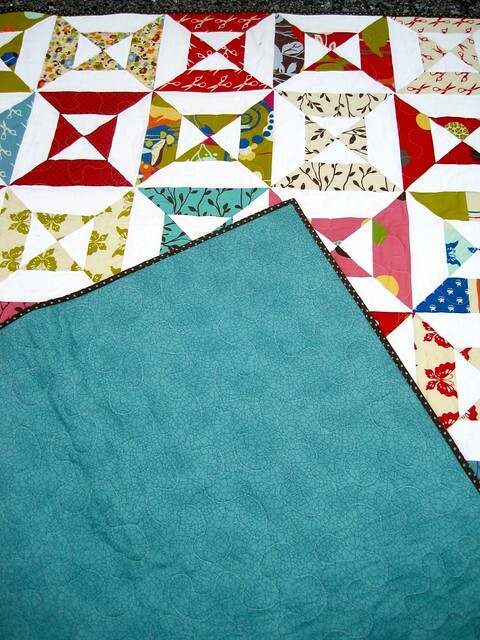 I have a Layer Cake and some other squares that I've been hoarding for a special project. What is the solid you used? I like that it brightens things up; Wonderland's background can look a bit dull sometimes but it certainly doesn't here. This looks awesome! Your poor sewing machine is going to be lonely without you. 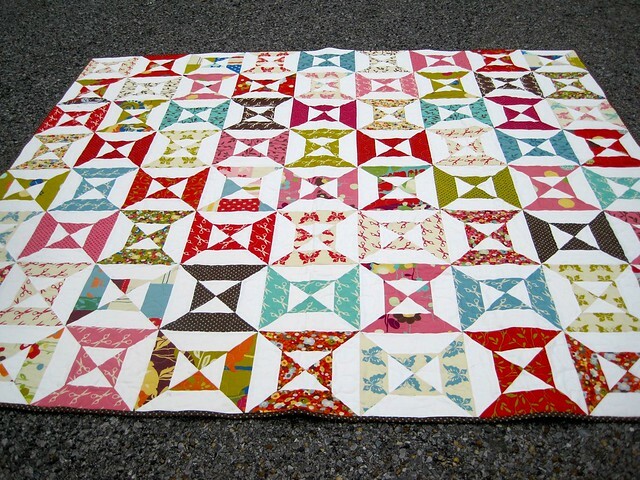 I love this quilt, and I love that song!! it's gorgeous, kelly! have tons of fun this weekend. kelle is just an absolute doll. i've enjoyed getting to know her and i know you will too. she's crazy talented. if you bring her homemade lemon cookies she'll love you forever! i love that you machine stitch your binding too. i haven't needed to use invisible thread, but i may need to do that on an upcoming quilt. it will have a scallop edge binding. either way it's a huge time saver and i personally like the look of it more than hand stitching and i know it's more durable. have a safe trip!! can't wait til you are here for good so we can hang out! I keep loving everything you make! Very eye catching! Happy B-Day - early. I love me a nice double hourglass... looks so clean and crisp. And our internet was finally acting a bit faster than dial-up, so I watched your FMQ and basting video -- you've sold me on spray basting. I was curious though if you always start with the top and if there was a reason, or if it mattered??? I was just curious. Cute projects! Happy Birthday friend! Runaway by Bon Jovi? or is there another runaway song?? happy birthday kelly, cant wait to hear about your weekend away! 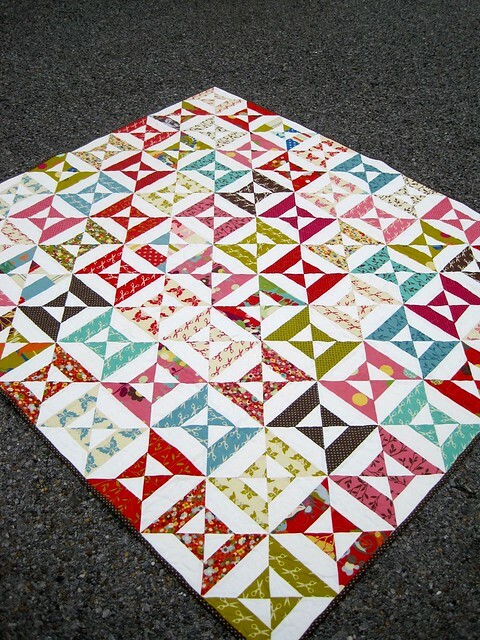 What a great quilt - love the colors! So glad you didn't put a border on - it's perfect w/o! i hope you have a wo wo wo wo wonderful birthday! and a super fun time at the workshop! love the quilt also. i love momo fabric a ton! It's beautiful. 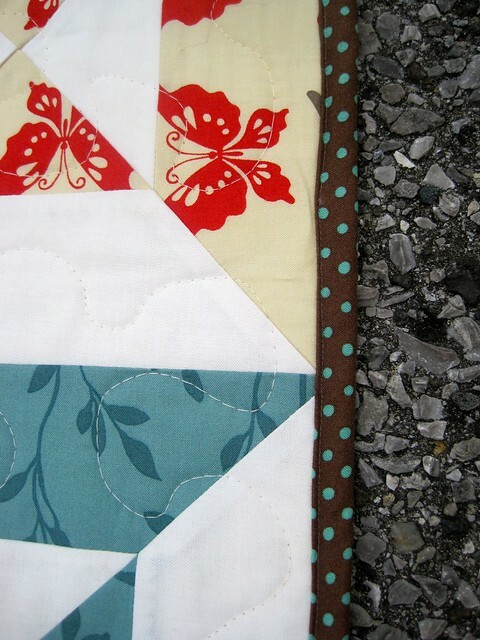 I love the quilt, and the backing is perfect!